Markets continue to rise this week, sending the S&P 500 to its fourth consecutive win. The positive mood was driven by strong corporate earnings, led by Goldman Sachs which rose 9.54% on strong Q4 2018 results. Investor confidence also got a boost from progress in ongoing trade negotiations between the U.S. and China on reports the U.S. is considering easing trade tariffs to serve as goodwill to China while trying to negotiate a comprehensive trade agreement. China, for its part, offered to boost its annual import of U.S. goods by a combined value of more than $1 trillion over a six-year period. Economic news in the U.S. continued to be light due to the ongoing government shutdown which prevented the Commerce Department from releasing December’s retail sales report. That left investors to digest reports on industrial production and producer prices. Those reports, however, took a backseat to China’s own trade data. The Chinese report indicated that the combination of slowing overall global economic growth and U.S. tariffs are beginning to take their toll on the Chinese economy. Markets interpreted this as a positive, believing it will increase their incentive to reach a settlement before even higher tariffs are instated. With optimism running high on the Street, the S&P 500 ended the week up 2.87%. Data from December showed that slowing global growth and U.S. tariffs are weighing on China’s economy. The country reported overall exports fell -4.40% from year ago levels, while imports fell -7.60% on weakening domestic investment and consumption. Meanwhile, exports to the U.S. fell -3.50% month-to-month in December, while imports of U.S. goods fell -36% as China stopped purchasing soybeans and other commodities. China is highly leveraged to inflections in global growth, and the added weight from tariffs is anticipated to help soften China’s resolve as both the U.S. and China seek to find a resolution to their trade differences. Despite global trade tensions, U.S. factory production continued to rise in December on strong U.S. consumer demand. Industrial production, a measure of overall factory, mining, and utility output, rose 0.30% in December, driven by a 1.10% increase in factory output. The gains were broad-based with vehicle and car-parts makers, appliance, clothing, and paper manufacturers all posting gains. Year-over-year (yoy), industrial production was up 4%. Capacity utilization, which reflects how much industries are producing compared with what they could potentially produce, rose 0.10% to 78.7% in December. This was the highest reading in roughly four years. The consensus heading into this report was that things were cooling in December, but this report was particularly strong relative to expectations. A key measure of U.S. producer prices fell -0.20% in December, reversing November’s 0.10% gain. The month’s decline was led by a drop in gasoline prices which fell -13.10% and followed a -14% drop in November. That more than offset a 2.60% increase in wholesale food prices. Core producer prices which exclude food, energy, and trade services remained unchanged in December after rising 0.30% in November. Year-over-year, producer prices were up 2.50%, matching November’s gain. Meanwhile, core producer prices were up 2.80% yoy, following a similar rise in November. PPI numbers are a tertiary read on inflation since increases at the producer level are not consistently passed along to consumers. As such, the 2.5% yoy rise in the index is not nearly as concerning as it would be at the consumer level, and with the Fed having signaled both this week and last that they remain data dependent with respect to rates, inflation is a distant concern for markets at the moment. What a difference a few weeks makes. The year-end hand wringing over the Fed and rates, China and the trade war, and earnings and future guidance has all but subsided since we crossed into the new year. It has helped that we’re now seeing December’s data, and the numbers suggest the economy continues to exhibit momentum, but the greater factor in this relief rally is simply the fact that concerns were too pessimistic in the first place. It is easy to say that in retrospect of course, but given that the market is moving most strongly as of late to the dovish remarks related to policy items (i.e. Fed’s more accommodating tone and U.S./China statements of goodwill), it would suggest that Q4’s volatility was simply this in reverse — backed by a whole lot of year-end tax selling — and it was not some deeper indicator of deteriorating conditions. Earnings reports will remain a major focus for markets for the next several weeks, with particular attention paid to companies’ forward guidance. Fortunately, investors will be assessing these reports with a far more stable psyche. Earnings season will continue to capture headlines with notable reports from technology and industrial giants as economic news in the U.S. will be light with existing home sales being the highlight of the week. Overseas, China will once again dominate headlines as it releases fourth quarter GDP. This weekend, sky watchers across the Western Hemisphere will have an opportunity to witness a rare event. It’s being called the Super Blood Wolf Moon because three things will be happening simultaneously in the night sky. This combination of events will not happen for another 18 years. First, the full moon of January will occur Monday, January 21st, but will appear full the night before. The January full moon is often called the Wolf Moon. Second, there will be a total lunar eclipse overnight from Sunday, January 20th to Monday, January 21st. This will be the only total lunar eclipse of 2019. A total lunar eclipse occurs when the sun, Earth, and moon are aligned so that the Earth blocks any direct sunlight from reaching the moon. Some indirect sunlight still reaches the moon. However, particles in the atmosphere scatter blue light. 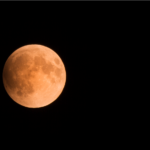 Colors with longer wavelengths like red pass through the atmosphere and bounce off the moon giving it its reddish hue and its “blood moon” moniker. Third, on January 20th, there will be a supermoon which happens when a full moon closely coincides with perigee, the moon’s closest point to Earth in its monthly orbit. Supermoons make the moon appear a little brighter and closer than normal, although scientists say it is imperceptible to the naked eye. The moon’s average distance from the Earth is 238,855 miles. During the upcoming supermoon, the moon will be 222,042 miles from the Earth. Lunar eclipses do not happen every time the moon makes its monthly orbit around the Earth because the moon travels in a tilted, elliptical path that is usually above or below the Earth’s shadow. Total lunar eclipses are more rare since they only happen during a full moon and only when the sun, Earth, and moon are precisely aligned. This usually happens twice per year, and each total eclipse can only been seen from one hemisphere of the Earth. This weekend’s rare celestial event will last nearly 3.5 hours. If the skies are clear, viewers in Texas will first see the partial eclipse beginning at 9:33 p.m., and totality — when Earth’s shadow completely blankets the moon — will begin at 10:41 p.m. Totality will last a full 63 minutes. The maximum eclipse will occur at 11:12 p.m. 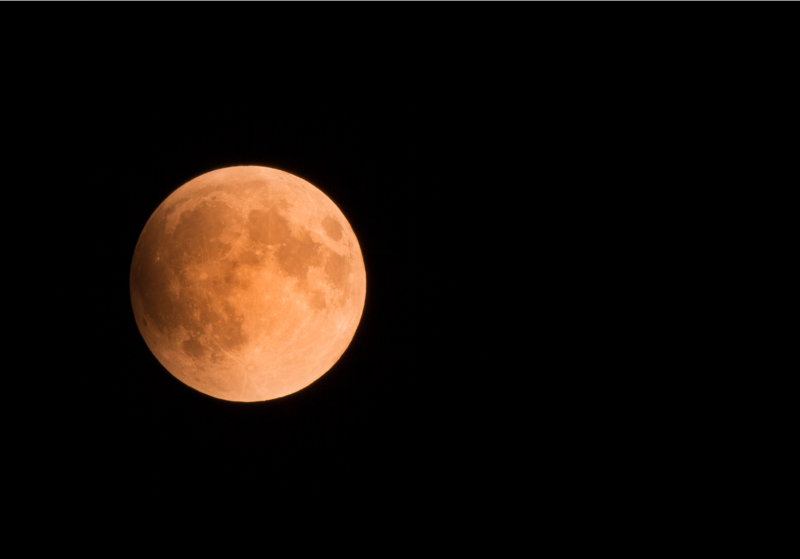 The last bit of shadow will leave the moon at 12:50 a.m. for viewers in the Central time zone. Since Monday is Martin Luther King Day and a holiday for many businesses and schools, viewers can stay up later to see the Super Blood Wolf Moon. The forecast calls for clear skies but cold temperatures so bundle up.